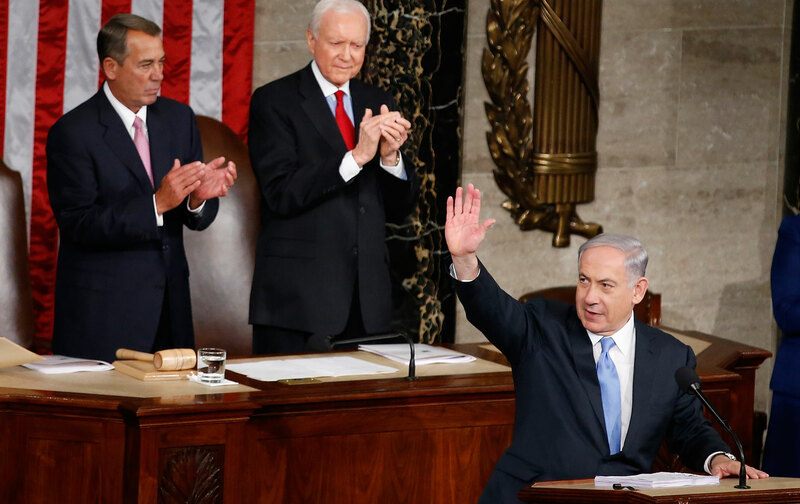 House GOP lauds Netanyahu’s win as "hard-fought and well-earned." Almost 200 House Republicans are sending a letter to Israeli Prime Minister Benjamin Netanyahu congratulating him on his victory in Israel’s snap election Tuesday. Netanyahu sailed to victory on the heels of two controversial late-campaign statements to rally his base: a warning, replete with George Wallace–esque shades of bigotry, that Palestinian citizens of Israel were “coming out in droves to the polls” and a vow that a Palestinian state would not be created on his watch. In a spate of interviews with American news outlets, Netanyahu tried to walk back his remarks. Whatever one makes of his new Thursday position on a Palestinian state—a lot of people aren’t buying it—Netanyahu’s explanation of his bigoted warning about Arab voters left much to be desired: “I wasn’t trying to suppress a vote; I was trying to get out my vote,” he said. Enter House Republicans. In the letter, which no Democrats have signed on to, Representative Ron DeSantis of Florida lauded Netanyahu’s victory and even his means of achieving it. “Your victory was no doubt hard-fought and well-earned,” the letter, first reported by the neoconservative news site Free Beacon, said. A hundred and ninety members of the House GOP signed on as of this morning. The White House complained that the remark about Arab voters undermined the foundations of the US-Israel relationship. “These kinds of cynical, divisive election day tactics stand in direct conflict to… the values that are critical to the bond between our two countries,” said spokesperson Josh Earnest. Palestinian citizens of Israel make up roughly 20 percent of the Jewish state’s population. DeSantis also complained in a separate statement released Wednesday alongside the letter that President Obama had not yet congratulated Netanyahu on his victory (though Netanyahu had himself taken two days to congratulate Obama on his 2012 re-election). On Thursday, Obama called Netanyahu to congratulate him, but added that the United States “will need to reassess our options following the prime minister’s new positions and comments regarding the two-state solution,” a White House official told Reuters—hinting at allowing possible action against Israel and toward a two-state solution in international fora, where the United States has heretofore exercised blanket opposition to measures targeting Israel. The DeSantis letter’s partisan nature underscores the closeness of Republicans and Netanyahu’s Likud party—a trend largely driven by the GOP and Likud themselves, as when Netanyahu effectively endorsed Mitt Romney in 2012. Republican House Speaker John Boehner, who engineered Netanyahu’s controversial Congress speech earlier this month with Netanyahu’s US ambassador (and former Republican operative) Ron Dermer, today announced plans to travel to Israel. The cozy relationship, it seems, extends to a fondness for racially charged electioneering tactics.